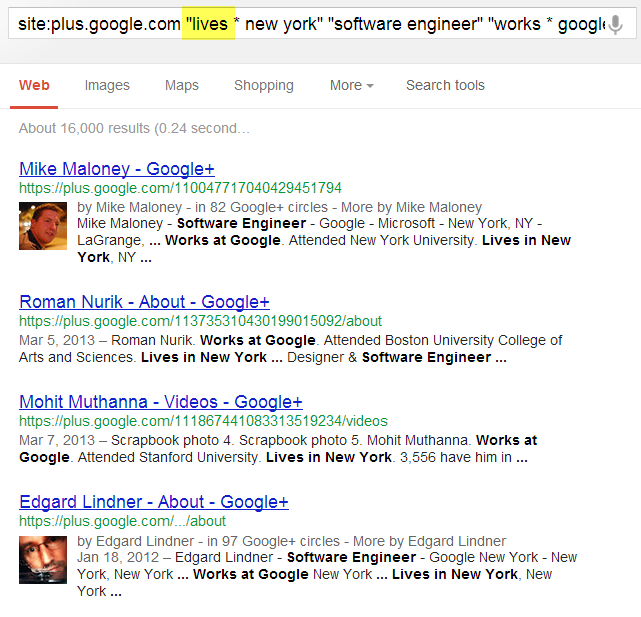 Do you want to know how to search for people on Google+ by title/skill, company, AND location? 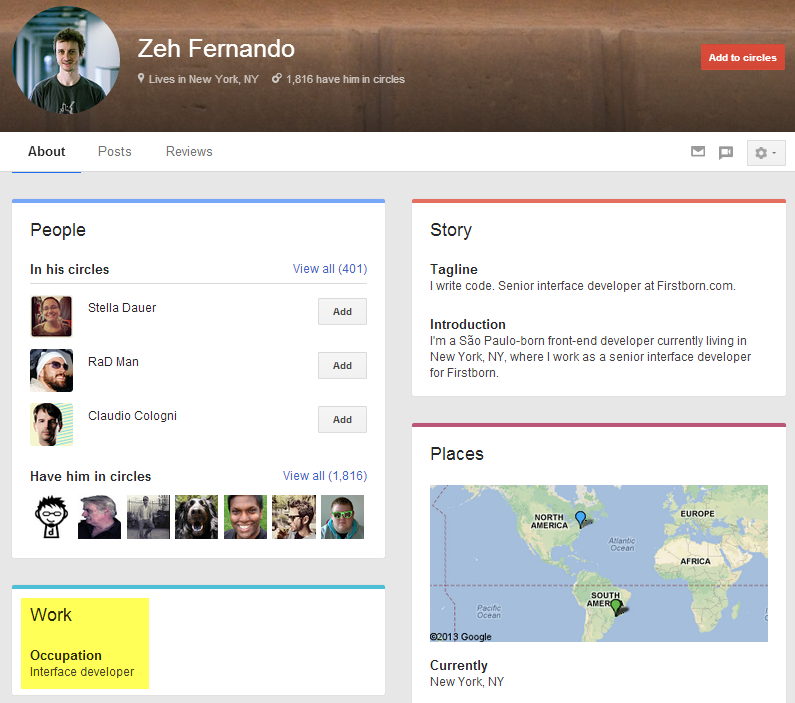 Back in 2011 I wrote a post about how to search Google+ to find people in specific locations. At the time, Google+ wasn’t a ghost town, but it wasn’t exactly well populated. Nearly 2 years later, that’s no longer the case – Google+ now has over 500M profiles, 235M+ of them actively using Google+ features, and 135M+ people are active in the Google+ stream, solidly positioning Google+ in the upper tier of the “Big 4” social recruiting sites (Facebook, LinkedIn, Google+, Twitter). While the massive change in users and activity has been great, one thing that unfortunately hasn’t changed is that Google+ still doesn’t have any built-in functionality to reliably search for people by specific location, which is critical to any sourcing and recruiting effort. While Google+ has recently released a new “Find People” functionality, it doesn’t allow you to find people by where they are located. What you can do, however, is search for people who work at specific companies using the “Find coworkers” search functionality and entering in any company. What you can’t do with this search functionality is search by people who work at specific companies in specific locations. which is critical to most sourcing and recruiting efforts. 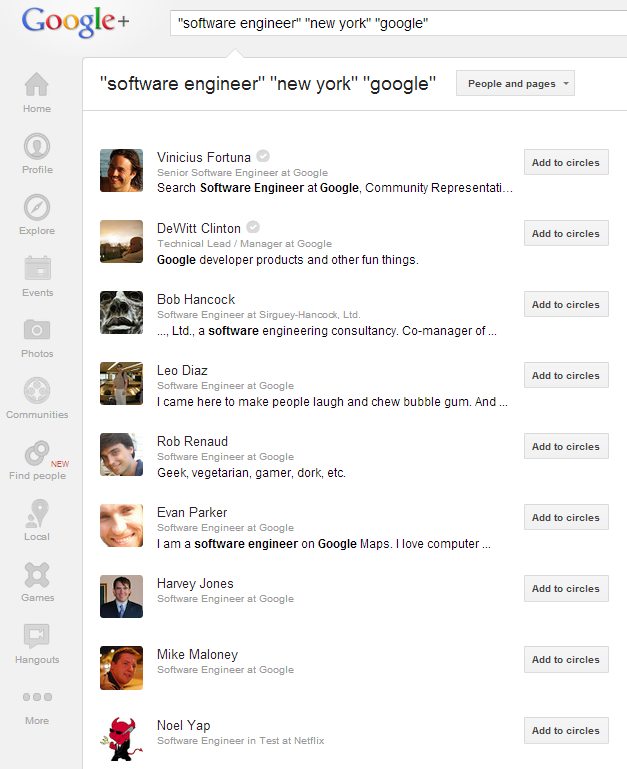 However, if you’re new to Google+, you should be impressed by your ability to find anyone. In this respect, Google+ is similar to Facebook’s Graph Search and unlike LinkedIn, as you don’t have to be connected to people or have them in Circles to find them and view their profiles, which is fantastic for sourcers and recruiters. 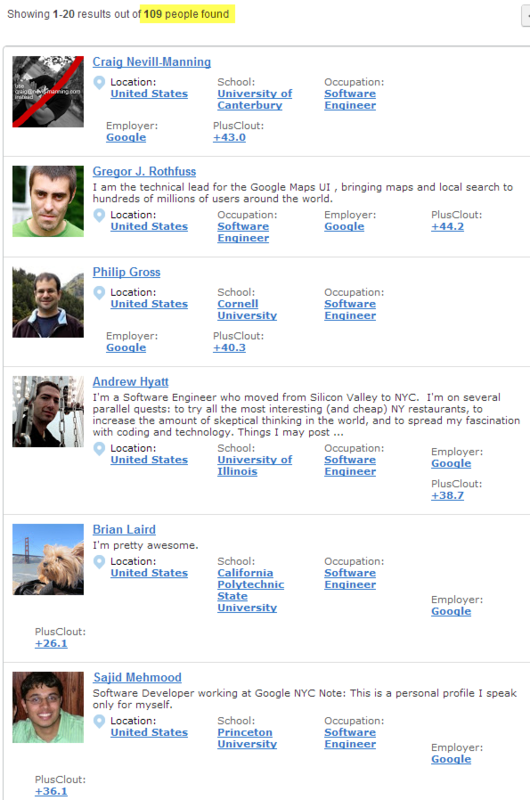 You can see from just that screenshot that not all of those people work at Google (although many do), and if you explore the results individually, you’ll find that they all mention “New York” somewhere (as they should, based on my search criteria) – but they don’t all live in New York. You can see she attended school in New York, but her location isn’t revealed on her Google+ profile as it is for others. Cross referencing her on LinkedIn shows she lives in California. I’m not slamming Google+’s search bar – it does a decent job, but it doesn’t offer sourcers and recruiters the search precision they need. 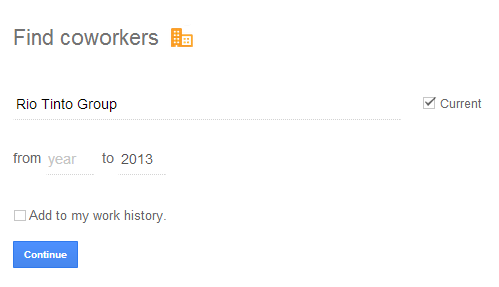 Some of you may be aware of FindPeopleonPlus, which you can use to find people by employer, occupation, and location. Unfortunately, according to their own website, FindPeopleonPlus has only indexed 45M users, which is now obviously a small portion of the total population of Google+ users. The above search found 109 people, which isn’t too shabby. However, I’ll show you how to use Google to X-Ray search Google+ to find more people in a moment. 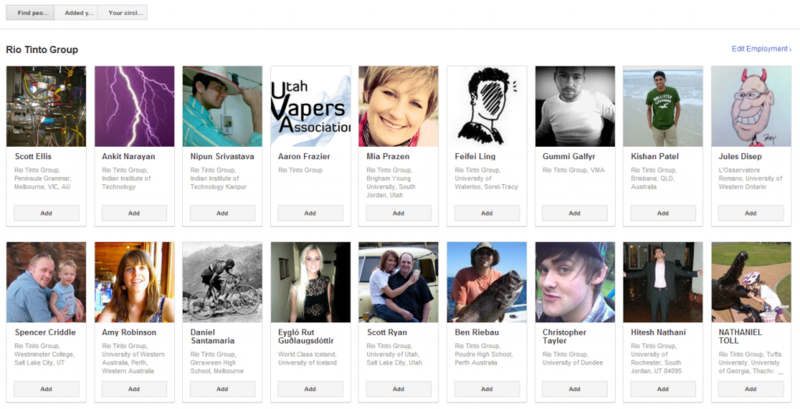 FindPeopleonPlus does have some great functionality – you can search for/sort people by gender (diversity sourcing! ), education (specific university), employer, occupation, state, and city. 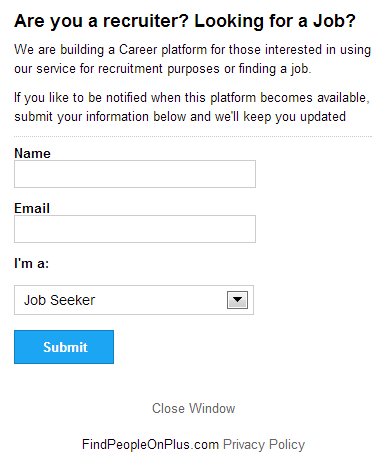 Interestingly, it appears they are busy building a “Career Platform” – I’m assuming this won’t be free because what they’ve already built can easily be used by recruiters to find candidates. Hopefully they will speed up their performance – I noticed my searches lagged significantly. But maybe I’m just spoiled. Matt’s got a sense of humor. Maybe Kelly can add the ability to search Google+ for people by employer, occupation and location like FindPeopleonPlus can. Am I the only one that is confused and disappointed by the fact that the Google team hasn’t thought to offer a greater degree of search capability? Even Facebook’s Graph Search offers the ability to search by location, current and past employer, current title, etc. I thought Google = search? To this day, using Google to search Google+ remains the best way to reliably find people on Google+ by location. 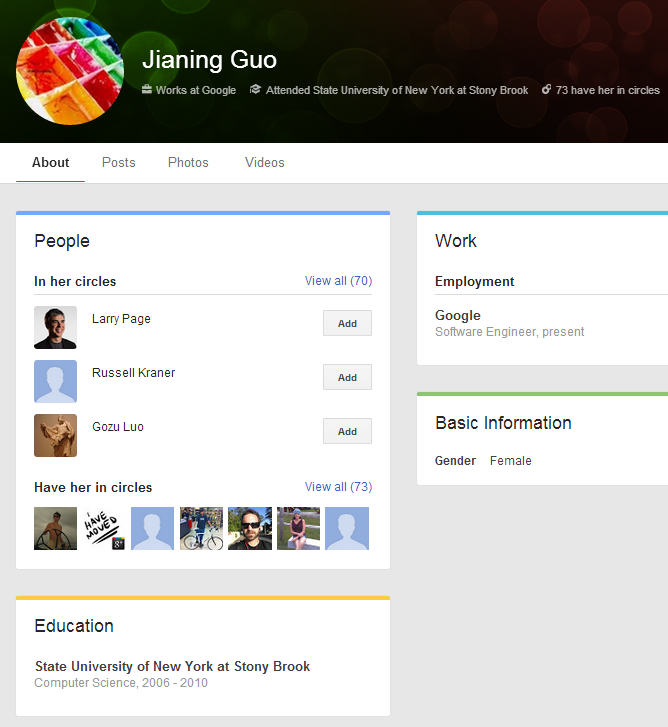 Over time, Google+ has made multiple changes to Google+ profiles, so while my original (circa 2011!) Google+ X-Ray search still works, there are a few small adjustments I’ve made based on profile changes that allow even greater control over search results (thanks Google+ team!). 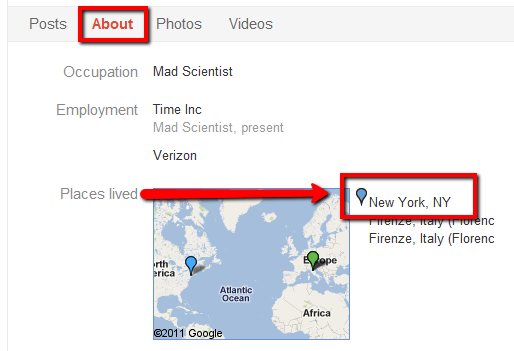 Back in 2011, when it came to listing locations on Google+ profiles, they were displayed in the “Places Lived” section. “Places Lived” doesn’t exist anymore – it’s now just “Places,” and the word “lived” is no longer there to search for exactly as I did in the past. However, location information from Google+ profiles is now often also displayed in the summary info at the top of a person’s profile, and it can be listed as “Lived in ________” or “Lives in _________” – you can search for either or both. Here’s where it’s picking up the “Lived in,” which pulls from their list of locations on their profile. When checking some of the Google+ results to see if the the people did in fact live in the location I specified, I cross referenced them on LinkedIn. 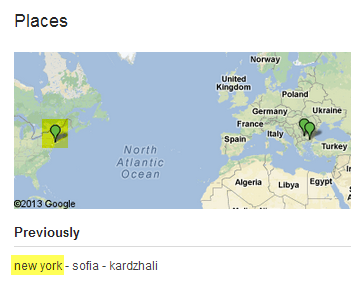 Interestingly, when I cross referenced one of the results from my New York search on LinkedIn, their LinkedIn profile stated that they currently lived in Bulgaria instead of New York, which was initially disappointing, at least until I performed a Facebook Graph Search for her, where I was able to confirm she does in fact live in New York. Hopefully I am not the only who finds this interesting, although not all that surprising when you think about it – Facebook can be more accurate than LinkedIn. You’ll notice some dupes in the results for hits on the same person from multiple places on their profile, such as the “About” and “Videos” sections. site:plus.google.com “lives * new york” “software engineer” “works * google” -inurl:(about|photos|videos) – you’ll get 118 clean results from the original 135. One thing you can do using Google to X-Ray search Google+ for profiles that you can’t do on FindPeopleonPlus is Boolean search with no limitations. For the Boolean bashers (I know you’re out there! ), basic Boolean logic allows the ability to search for multiple titles, skills, and or companies in a single search string. Although FindPeopleonPlus does support basic Boolean logic for keywords, they don’t allow the use of Boolean logic to simultaneously search for any of a number of employers or occupations/titles. 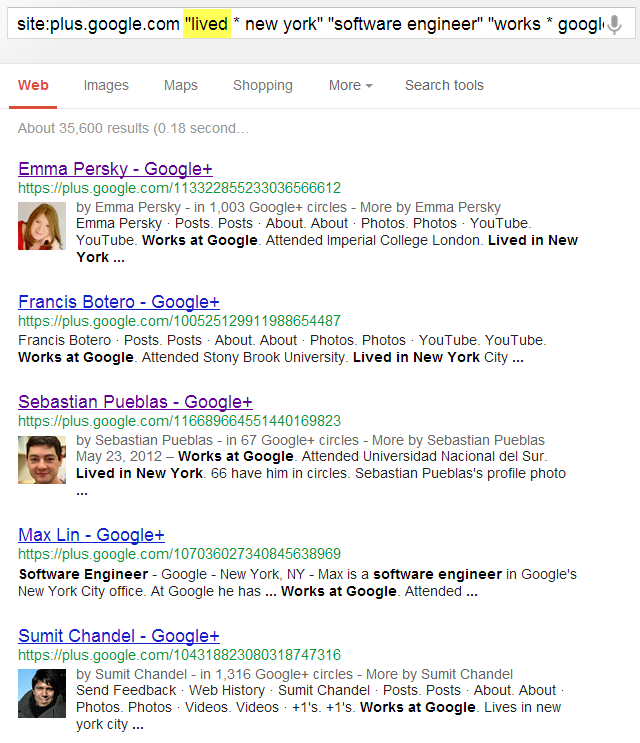 With a search interface similar to FindPeopleonPlus’s, you’re limited to one company, title, etc. at a time per search. Yes – it still “works,” but it feels like wearing mittens vs. fingerless gloves when you know how to get exactly what you want and you can’t get exactly what you want in a single search like you can with Google. That Google search returns 137 results in New York. With FindPeopleonPlus, you get 3 results in the entire world. Of course, you don’t have to target companies in your search strings. There are many other interesting things you can do with Google+ X-Ray searches – I just wanted to provide you with a few “starter” searches to get you going. Google+ Got Your Attention Now? There’s no doubt that LinkedIn is “where it’s at” with regard to deep and highly searchable human capital data, and I don’t think LinkedIn is becoming “saturated” as many people seem to be suggesting recently – most sourcers/recruiters only find and review 20-30% of what’s available to be found on LinkedIn, leaving at least 50M (if not 100M+!) profiles unfound/unviewed. No, I am not exaggerating for effect. Even with sourcers and recruiters only scratching the surface of LinkedIn, Google+ cannot be ignored. 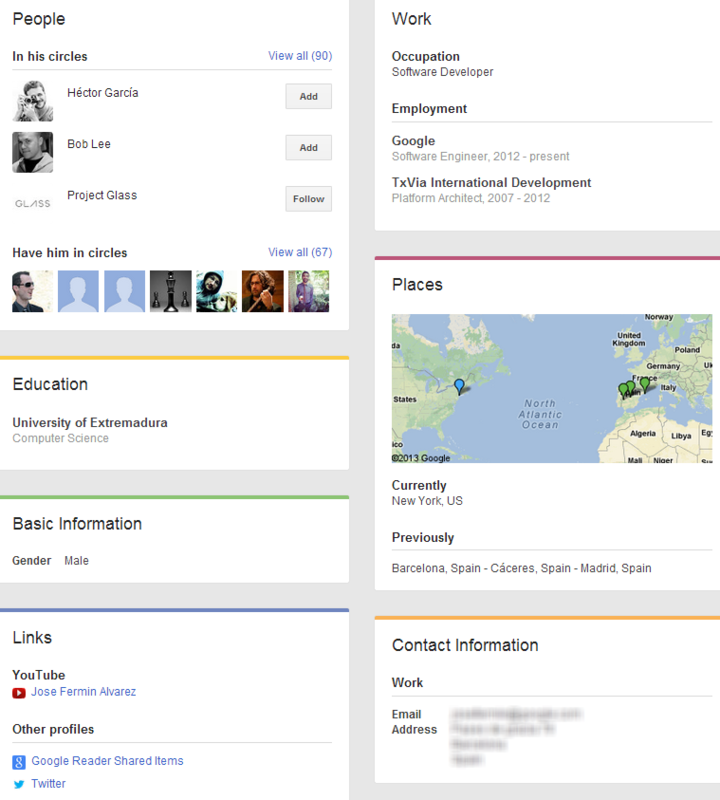 Google+ now has more profiles than LinkedIn and is the most active social network in the world second only to Facebook. Yes, I know – Google+ haters/doubters like to argue about what “active” really means…who cares?!?! Most Google+ naysayers haven’t spent 5 minutes on Google+. Get on Google+ and do some searches and I think you’ll be impressed with what you can quickly and easily find. Explore Google+ a little bit (actually USE it for a few weeks) and I think you’ll be surprised by the functionality and the many benefits and advantages if can afford sourcers and recruiters. Yes, that’s an email address I blurred out. It’s there for anyone to find – it’s not listed because I know them or have them in a Circle – because I don’t. Of course, there are many advantages of using Google+ in your sourcing and recruiting efforts that are beyond the scope of this post. As for me – I don’t care if you never use Google+ for sourcing and recruiting. It just means I have less competition.